As the federal and state response to Hurricane Katrina demonstrated, a failure to understand and utilize legal authorities properly during a disaster can slow response efforts, destroy trust in governments, and exacerbate chaos and civil unrest. 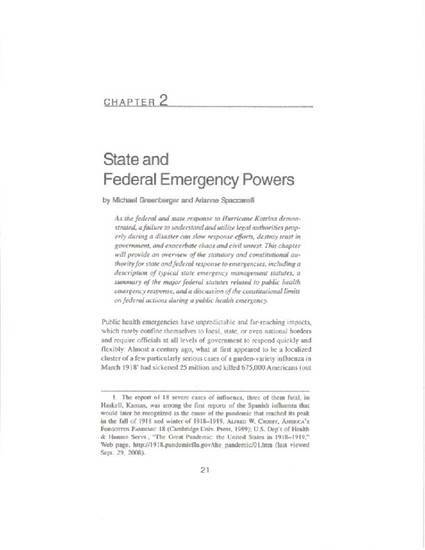 This chapter will provide an overview of the statutory and constitutional authority for state and federal response to emergencies, including a description of typical state emergency management statutes, a summary of the major federal statutes related to public health emergency responses, and a discussion of the constitutional limits on federal actions during a public health emergency. Joe D. Whitley and Lynne K. Zusman, eds. Homeland Security: Legal and Policy Issues. Chicago, American Bar Association, Section of Administrative Law and Regulatory Practice, 2009. Chapter 2, p. 21-41.